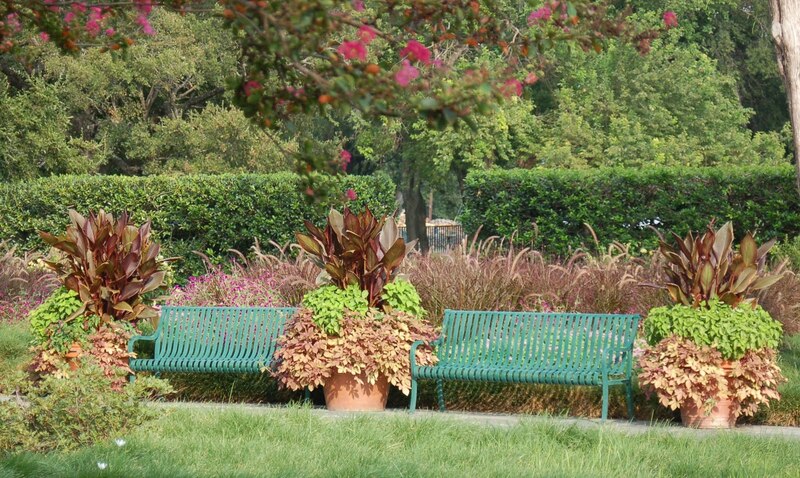 Funny thing about this planting – it was supposed to have more lysimachia but somewhere along the planting process I was called away to do something else and didn’t realize that I had forgotten to add the extra lysimachia until I came back to take the picture. So this container has a Aniken Skywalker ponytail. At least for now. In those cooler days of Day 204, my Crossandra hadn’t started blooming yet so here’s that day’s planter now with the bright yellow crossandra blooms. A little over a month ago I brought these planters home from the greenhouse. 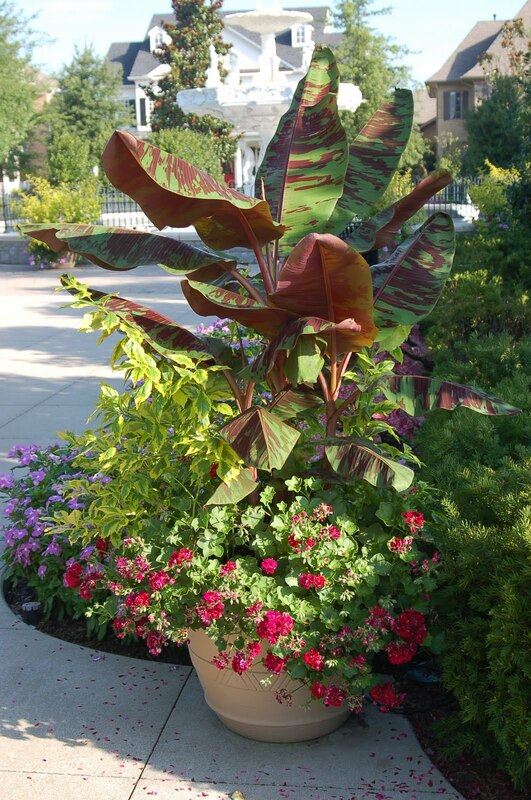 The center plant – a variegated Manihot or tapioca plant – was a new plant for me to use in container plantings and they had seemed to be desperately struggling. After arriving in the greenhouse in pristine condition from Greenleaf Nurseries, they fell under the fascination of my morning watering guy who was determined to make sure this beautiful plant did not dry out. Knowing that all this attention could drown this plants’ hope for success, I instructed the planting crew to go ahead and assemble the inserts [these are the pressed pulp pots that we use to plant many of our container plantings in at the the greenhouse, where we allow them to fill in, then plop them into the designated decorative container] using the somewhat over-watered Manihot. 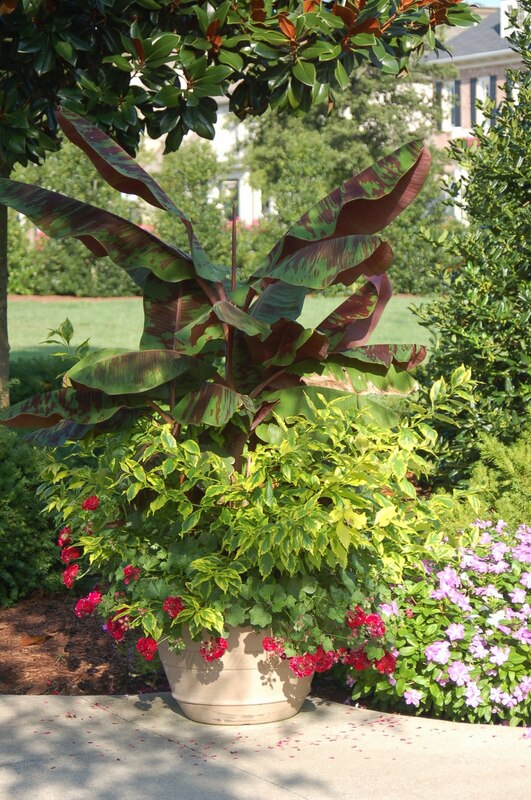 Bottom line – these poor plants went through some rough handling in the replanting process, resulting in them completely defoliating within hours of replanting. And this in turn led to my morning watering guy (even after repeated instruction in correct watering requirements) determined to bring this plant back to life with more water. So the struggling stick-looking Manihot with their newly planted small plugs of coleus, calibrachoa, and verbena that surrounded them came home with me, to sit on my back wall – to soak up the heat and sunshine, to be given time alone to heal with proper attention needed for healthy survival. The plugs have flourished, the Manihot is determinedly putting out new leaves though a few bare places remain. Time, and care by those that understand what is needed, help to bring recovery. This past spring has been a season of abundant good things – graduation from high school for #3 son that came with accolades, awards, and scholarships; wedding plans for #2 son with all the joy and busyness that brings; the enjoyment of having #4 son willingly work alongside me in my vegetable garden and seeing his excitement about growing our own food; a week of enjoying #1 son’s family (including the adorable grandson!) who live so far away; and on top of all that, fulfilling the incredible opportunity for me to write a book on container gardening. But this past spring also has been a season of hardship – learning that the precious friend of #3 son has Leukemia and watching her battle with the effects of treatment; sending #1 son back to the middle east for his third tour of duty with the Marines; the tragic death of #4 son’s friend and the effect it has had on our school and community; watching the devastation of tornadoes around the country; and even the life-changing accident of my co-worker’s husband, which in its ripple effect, meant more time I needed to be at work and less time to be writing the book that I so eagerly want to finish. in the warmth of Christ’s love, in the knowledge of His faithfulness, in the friendships that walk with me, and even in the caring for others who are hurting. And we keep on growing. or at least climbing the ladder that corporate provided for me to get my job done. 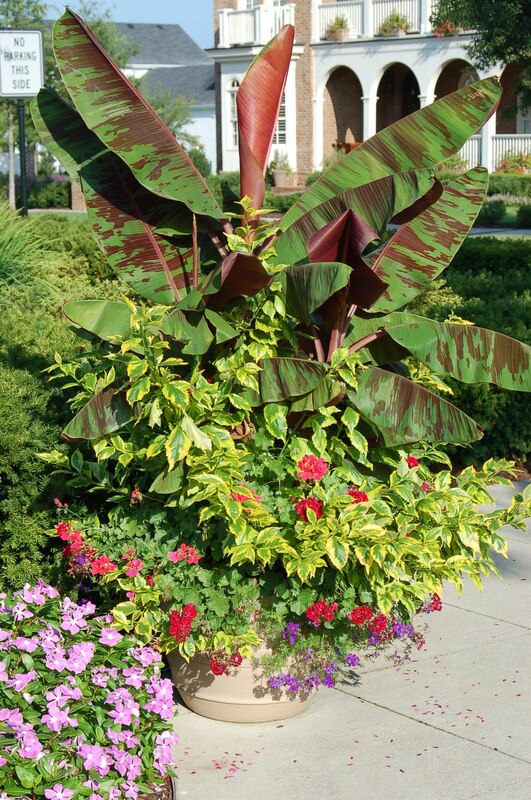 Luis, my right hand man, convinced me that he would plant just as well as I could – and he would move the plant a half an inch over if I asked him without even a hint of an eye roll – if I promised not to get up on a ladder/get all lightheaded again. I am now safely planting these containers that are a little bit closer to the ground. Bouganvillea ‘Golden Jackpot’, tropical plumbago, sweet potato vine, verbena, Phlox Intensia Blueberry, red vinca, golden duranta. and what fun that is! 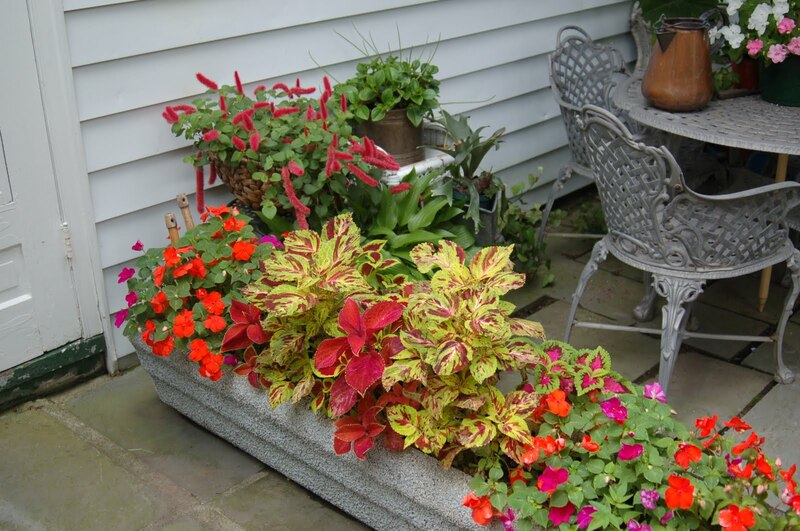 But like children, each container, though made up of the same plant material, looks a little different. Musa ‘Siam Beauty’, Duranta ‘Gold Edge’, Ivy geranium ‘Taj Mahal’, purple verbena. 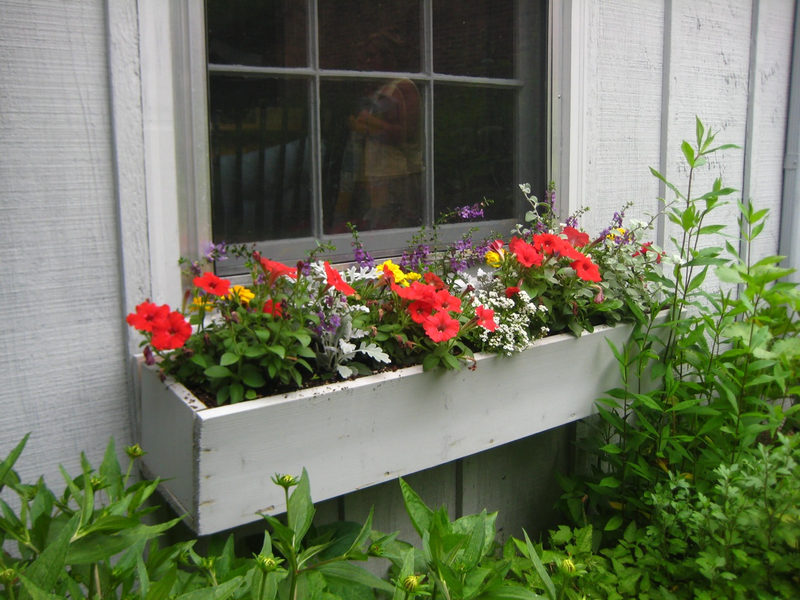 Day 232 – Three Plants, Three Planters, Three Cheers! My friend Heidi Delvaux sent me pictures of her containers that she just did. She had me thinking there that she wasn’t sure what she was doing, but I think she did real good! Love the combinations of different white tones that she threw in there with the dusty miller, the snow princess, and the licorice plant. 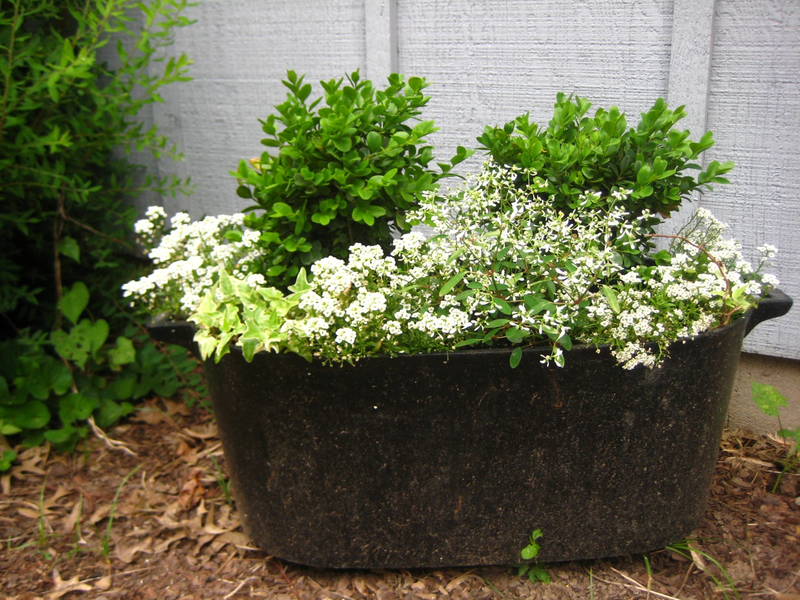 Heidi said this was an old ham pot that she used for this great combination of white and green. 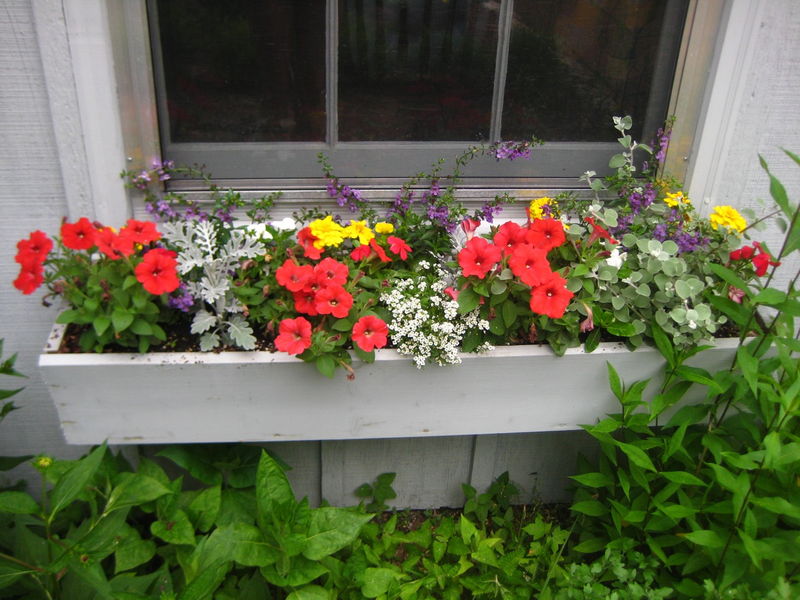 …I get to add another container picture (from Buffalo, NY) to my 365 Days of Container Gardening. That was close – I really don’t like unfinished projects. Though I do have a container gardening book project extended deadline that is proving as hard to fulfill as this end-times prophesy. What was I thinking!?!?! ?